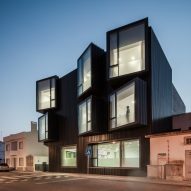 Nuno Piedade Alexandre has completed a black extension to an elderly care centre in the municipality of Ponte de Sor, Portugal, which is covered with protruding windows. 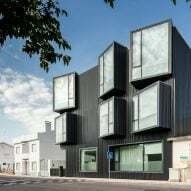 Nuno Piedade Alexandre, a studio based in the nearby city of Santarém, created the building as additional accommodation for the Santa Casa da Misericórdia's Elderly Care Centre in the Portalegre district. 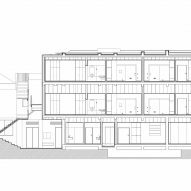 The extension is positioned in a prominent place when viewed from the adjacent street. 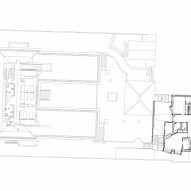 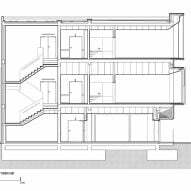 It fills the maximum available space on the plot in order to optimise the internal floor area. 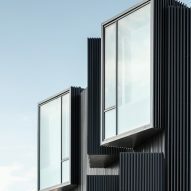 Each of the bedrooms features an opening that extends out from the facade. 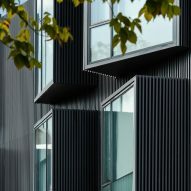 The glazing breaks up the black slatted surfaces and lends the building a dynamic, heterogeneous appearance. 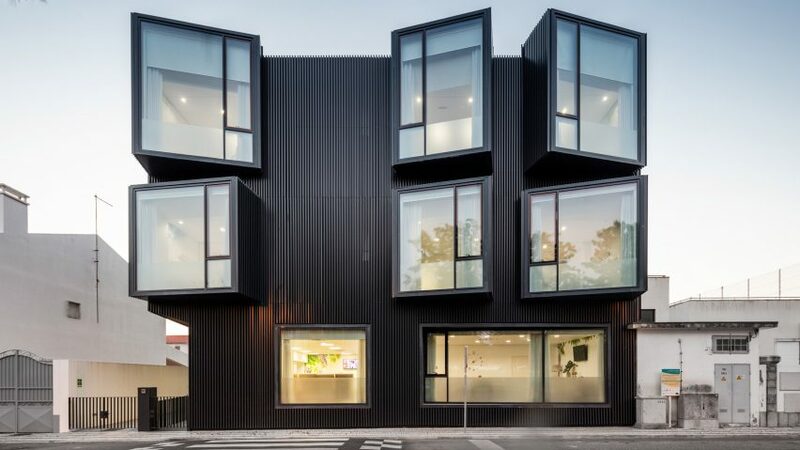 "The volume dematerialises itself through the projection of the rooms outwards, distorting the main facade in the search for a special sculptural moment that can speak for itself and be kind of singular, in the way that every patient should be," said the architecture studio . 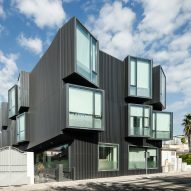 The accommodation is designed around the needs of its users, with a focus on the quality of light and interesting spaces created by the angular surfaces. 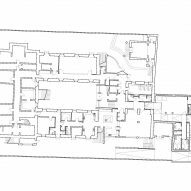 Ten twin rooms and four individual rooms have been added to the centre, each with their own private bathroom facilities. 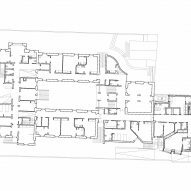 The new addition occupies an area to the rear of the main building, and is arranged so that some of the existing circulation areas extend seamlessly between the two. 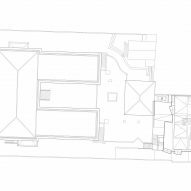 The rooms have a ceiling height of 2.7 metres and culminate in openings that reach 3.5 or 4.5 metres in height, which helps to funnel additional daylight into the spaces. 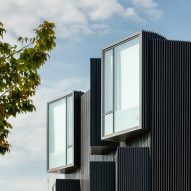 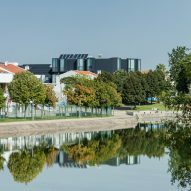 Each of the windows is angled to create a different relationship with the surrounding streetscape and frames a specific view of nearby trees, the skyline or the River Sor, which flows close by the site. 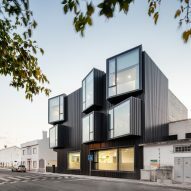 "The project results from a functional programme, a concept of living experience and use, and the relation of the building with the surrounding urban grid," added the architecture studio. 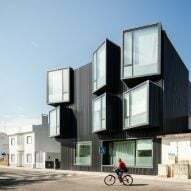 Several other recent projects from Portugal with striking facades, including Guilherme Machado Vaz's geometric house in Afife that looks like a plain white box when the colourful shutters are closed. 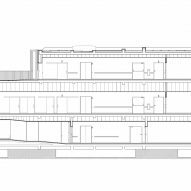 Projecting volumes also featured in a Brutalist-style concrete sports centre designed by Valdemar Coutinho Arquitectos for seaside municipality of Viana do Castelo.